You can make your own delicious plate of homemade gluten free flour tortillas! Recipe below. Being from New Mexico, I grew up eating burritos and quesadillas. Since giving up gluten, those have been pretty high on my list of foods I miss. I’ve been trying for a while to find good gluten free flour tortillas. Store bought wraps are thin and flavorless, while the recipes I’ve tried have produced tortillas that are too thick, weirdly pale, and hard. Blech! Enter Grandma T. (That’s my mom, and she’s been gluten free a little longer than I have.) She has always been great with cooking and baking, and has made it her mission to find recipes for gluten free items that are so good, you won’t believe they are gluten free. She has discovered the secret to soft, tasty gluten free tortillas, and she’s letting me share her recipe with you. You’ll be on your way to gluten free burritos in no time! ^A note on the flour – if you substitute a different all-purpose flour, you may not achieve the same results. Bob’s Red Mill contains chickpea and fava bean flours, which are key in achieving the proper texture and flavor. It can be found in grocery stores and on Amazon.com in the United States, and at Holland and Barrett or Amazon.co.uk in the United Kingdom. Roll the dough into balls, then press into curved discs. Mix all of the dry ingredients together (we used a whisk.) Add the shortening and cut it in with a pastry cutter. This part takes a little while – you should have no clumps. Then, take your water/milk combo and add it slowly – start with a little less than half a cup and added more as needed in small splashes. Stir (don’t smash) the flour until you start to get a dough. There shouldn’t be any dry flour spots. Then, knead the dough with floured hands. The dough will be a bit sticky, but shouldn’t coat your hands. If it’s that wet, add a little more flour to soak it up. If it’s too dry, it might crumble and crack, and you can add a bit more water to fix that. Once you’ve achieved a nice, slightly sticky dough, divide and roll it into 12 balls. Then, press each ball into a disc with raised edges. This will help keep your tortillas round(ish) when rolled out. Roll the discs out flat, using lots of flour and flipping often. Flour a wooden board and a rolling pin. 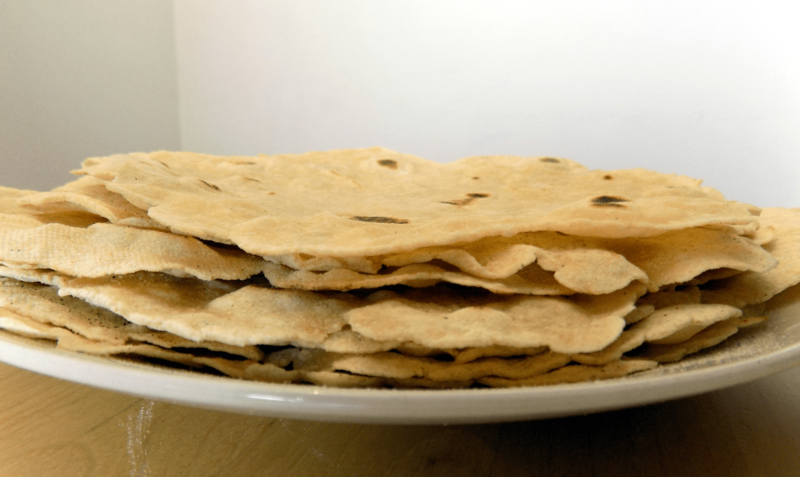 Roll out each disc into thin, flat tortillas. The trick to keeping them from sticking is lots of flour and flipping often to re-flour surfaces. Roll from the center out towards the edges. You will probably find it difficult to keep them totally round, and that edges have a tendency to take odd shapes, kind of like flower petals. This technique is a little tricky and just takes practice. Once you’ve got them rolled out and thin, gently shake off the excess flour by flipping the tortilla from hand to hand. Stack them on a plate. 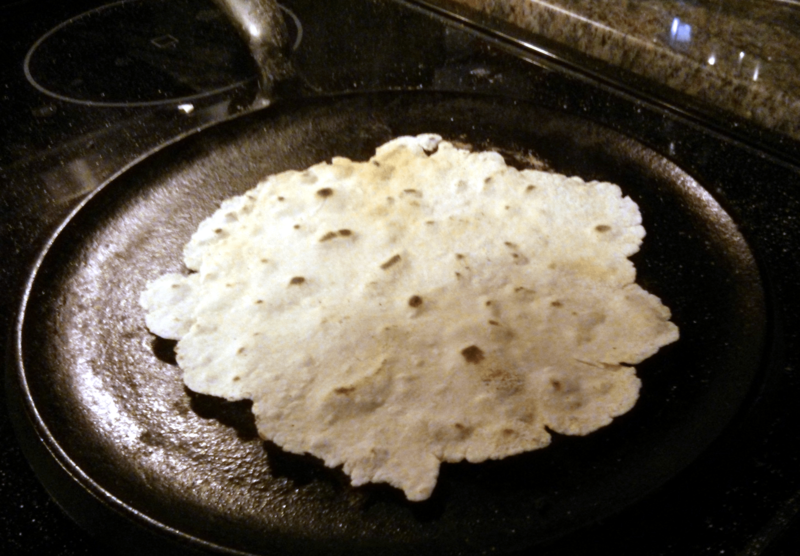 When you see dark brown spots like this form on the bottom side, it’s time to flip the tortilla over. Once you’ve got a few made, heat a *comal or medium frying pan to medium heat. You don’t need any oil or butter, just the dry pan. Finish rolling them out while the pan heats up. Once you’re ready, gently lay the tortilla in the center of the hot pan. You’ll see it start to bubble a bit; pop any large bubbles with a fork. Check the bottom side of the tortilla frequently; when you start to see brown spots appear, it’s time to flip. No need to poke the bubbles on side two, and watch it closely as it will cook faster. Again, look for brown spots and once you see them, you’re done! Stack the warm tortillas on a clean plate. Continue cooking each tortilla in this way until you’ve done them all. If you find they are still a bit floury after cooking, you can use a basting brush to knock off any excess. That’s it! These are best served straight away – you can make gluten free quesadillas or burritos, or just eat them plain with a little butter on top. You can store extras in a Ziploc bag in the refrigerator for 2-3 days. We froze a couple and they were still good when thawed a few days later. Let me know what you think in the comments! Grandma T’s gluten free recipes will be featured on Gluten Free Fab Life from time to time – check back soon to see what she’s cooked up! ← Are flavored coffees gluten free?